Creepy Castle is the seventh level of Donkey Kong 64. It is a haunted castle high atop K. Rool's warship. The Kongs must have at least 80 Golden Bananas for B. Locker to allow them to enter the level. The Kongs can only enter this level from its lobby from using a large Barrel Cannon near K. Lumsy's Prison. Although Creepy Castle is said to be located on K. Rool's Crocodile Isle, it also appears to be floating above ground. If the active Kong falls off the location, they respawn back from the beginning portal. The level takes place both inside and outside of the old, abandoned castle. The outside involves a high climb around the tall castle. Like typical haunted areas, a continuous thunderstorm takes place in the area. Many of the enemies featured are undead, such as Bones and Ghosts, and is inhabited by Bats. The castle interior features haunted corridors, mostly-empty rooms, and haunted catacombs on the lowest floor. Additionally, this level is the first to have the red Kong Switches, which can only be activated from using the Super Duper Simian Slam move learned from Cranky Kong. In this level, the red switches are usually used for opening entrances to various parts of the castle. The boss of Creepy Castle is King Kut Out, a hastily-made cardboard cutout of King K. Rool. Creepy Castle is divided into different areas both within and outside of the castle. The outside mostly involves the Kongs climbing up the location. There are a few outside locations with a hidden Golden Banana, including a large tree and a greenhouse. The castle interior and crypt are covered in fog (similar to Angry Aztec's sandstorm mist). A loud moaning and a variety of haunted noises can be heard inside the area. The toxic waste pools featured in the level's lobby also appear in the dungeon and mausoleum. A number of rooms appear in the castle including: a museum with unknown statues, a barn and alter behind glass walls, a ball room with tile-decorated flooring, a library with a haunted passageway between bookshelves, and an empty room at the very top featuring a fan blowing upward. The lower levels inside the castle are home to a series of labyrinth catacombs filled with Bones and Bats. The skull-shaped crypt also has a Mine Cart challenge against its Resident Demon. 1 Inside the old tree by the castle entrance DK can go inside and shoot the targets to raise the water. Once risen he can swim to the Golden Banana. 2 DK can go into the lower catacombs of the castle to ride a mine kart. He must collect 25 coins to receive his Golden Banana. 3 Inside an inner passageway of the castle, DK must flip various puzzle switches to form his face. If successful, a Golden Banana is rewarded. 4 On the upper level of the castle DK can Simian Slam a DK Switch to proceed into the castle's book depository. He can then get a DK barrel and turn into Strong Kong to effortlessly go through each booby trap to get to the Golden Banana. 5 (Kasplat) Inside the old tree outside the castle lays DK's Kasplat. 1 Diddy should go up the circular path around the castle until he gets to Cranky's Lab. Diddy need to hop into the Diddy barrel right beside the lab to get his rocketbarrels and fly to the top of the tower on the roof. Now he has to go right into the bonus barrel, and win a golden banana. 2 Somewhere along the long circular path going up the castle, there's a red Diddy switch in front of a door. The player should Simian slam the switch to open the door. Then go inside. He has to follow the path until reaching a spacious room with a checkered floor. This is the ballroom! Defeating all of the enemies on the floor, make a Diddy barrel will appear. The player should Hop into it to get his rocket. Use them to fly over the candles in this room, thereby lighting them. When all the candles are lit, the bonus barrel appears. He has to fly right into it, and finish it to win a golden banana. 3 From the beginning of the level, forward on the path until the area with brown wooden stairs. The player needs to go to the edge and drop down to a new area. Then go inside the door to find a new underground place. He has to go left to the big skull. Shoot the peanut switch beside it to open it up and go inside. Now go left, then left again, shoot the peanut switch here and proceed. There are 4 switches here numbered 1 to 4. Chimpy Charge each of them in order (1, 2, 3, 4) to get a Golden Banana. 4 Where the warp pads are. The player should Drop down into the moat, swim to the entrance of the castle, then go inside the crack in the huge door. Go through these tunnels and the player will find a door that opens when he get close to it. He has to go inside. Go right and Simian Slam the Diddy switch. There's the golden banana! But if the player gets too close to it, the entire wall flips around. So he must shoot the Peanut switch from far away (the player must use the Sniper mode because the target is very far away) to make some chain ropes to come down from the ceiling. Swing on the chain ropes to the golden banana. 5 (Kasplat) From the beginning of the level, forward on the path until the area with brown wooden stairs. The player needs to go to the edge and drop down to a new area. The player should go inside the door here to find a new underground place with the Kasplat. 1 From the DK Door, follow the path to the second set of steps. Go around the steps and drop off the ledge, then enter the wooden door on the right. Inside, take the first right and go forward to a crypt. Shoot the Grape Switch on the left side to open the door, then enter and go down to a second Grape Switch. Shoot the Grape Switch, then quickly jump into the nearby Lanky Barrel. Orangsprint left down the corridor to the slime pit before the gate closes. Activate the Trombone Pad ( + ), then swing across the vines that appear to get a Golden Banana. 2 From the DK Door, follow the path up the second set of steps, then enter the opening on the right wall. Enter the tunnel and take the second left through the door. Take the left passage down and pound the Lanky Switch to open a large black door. Enter and activate the Trombone Pad ( + ) to make several Lanky Pads appear in the slime. Float from pad to pad to reach the Bonus Barrel to play Kremling Kosh. Beat the game to win a Golden Banana. 3 From the DK Door, follow the path up the stairs, then climb the ladder on the right wall. At the top, turn right and follow the path up to a Greenhouse. Pound the Lanky Switch on the left side of the Greenhouse to open the door, then enter to find a large hedge maze. Quickly go left and jump into the Lanky Barrel, then Orangsprint through the maze in less than 30 seconds to get a Golden Banana. 4 From Snide's H.Q., go forward and pound the Lanky Switch in front of the tower, then enter and defeat all the enemies to make a Lanky Pad appear. Shoot the three Grape Switches in the upper part of the tower to open the steam vent, then use the Lanky Pad ( ) to float up into a Bonus Barrel. Play Beaver Bother to win a Golden Banana. 5 (Kasplat) From the DK Door, follow the path up the stairs, then climb the ladder on the right wall. At the top, turn right and follow the path past the drawbridge to find a Kasplat. 1 From the DK Door, follow the path to the second set of steps. Go around the steps and drop off the ledge, then enter the wooden door on the right. Inside, take the first right and go forward to a crypt. Shoot the Feather Switch on the right side to open the door, then enter and take the right passage to a room full of slime. Pound the Tiny Switch to make several dead hands rise and fall in the slime. Ponytail Twirl from one hand to the next to reach the hand on the far wall to get a Golden Banana. 2 From the DK Door, follow the path up the second set of steps, then enter the opening on the right wall. Enter the tunnel and take the first left, then Ponytail Twirl over the chasm. Jump into the Bonus Barrel to play Teetering Turtle Trouble to win a Golden Banana. 3 From the DK Door, follow the path up the stairs, then climb the ladder on the right wall. At the top, turn right and follow the path up to a Greenhouse. Jump into the Tiny Barrel next to the Greenhouse to shrink, then jump onto the red mushroom to bounce to the roof of the Silo. Drop through the hole in the roof, then shoot all the flies to get a Golden Banana. 4 From the DK Door, follow the path up the stairs, then climb the ladder on the right wall. At the top, turn right and follow the path up to a Greenhouse. From the Greenhouse, go forward up the path across the moving platform to the Ballroom entrance. Use the nearby Tag Barrel to change to Diddy and pound the Diddy Switch, opening the Ballroom door. Change back to Tiny and enter the door, then follow the passage into a large Ballroom. Step onto the Tiny Pad and warp ( ) to a room with a brick shed in the center. Jump into the Tiny Barrel on the roof to shrink, then enter the small opening at the bottom to reappear in Frantic Factory. Race the Mini Car Race in a rematch and win to get a Golden Banana. 5 (Kasplat) From the DK Door, follow the path to the second set of steps. Go around the steps and drop off the ledge, then follow the right wall all the way around until the path ends, then Ponytail Twirl to a ledge with the Kasplat. 1 From the DK Door, follow the path up the first set of steps to a large dead tree. Enter the tree and Primate Punch the wall on the left Follow the path down the slope and turn right to face a door at the far end. Target and shoot the Pineapple Switch above the door, then go forward and jump into a Bonus Barrel. Play Beaver Bother to win a Golden Banana. 2 From the DK Door, follow the path to the second set of steps. Go around the steps and drop off the ledge, then enter the wooden door on the right. Inside, take the first left to enter a large room with a large skull door on the far wall. Shoot the Pineapple Switch on the right side of the skull door and enter. Inside, take right path and go forward to a large door. Shoot the Pineapple Switch on the door to enter a room with a large coffin in the center. Turn right and follow the right wall to the first Coffin. Primate Punch the Coffin door, then enter and jump into a Bonus Barrel. Play Searchlight Seek to win a Golden Banana. 3 From the DK Door, follow the path up the stairs, then climb the ladder on the right wall. At the top, turn right and follow the path up to a Greenhouse. Primate Punch the door on the wooden shack next to the Greenhouse, then enter. Primate Punch the ? Box in the center of the room to find a Chunky Pad, then press the to become invisible. Play the Triangle Trample ( + ) to defeat all the Bats and get a Golden Banana. 4 From the DK Door, follow the path up the stairs, then climb the ladder on the right wall. At the top, turn right and follow the path up to a Greenhouse. From the Greenhouse, go down the path and follow the right wall to find the Museum entrance. Pound the Chunky Switch to open the door, then enter and follow the passage into a large room. Follow the left wall and Primate Punch the three brass switches, then continue around to the statue that opened its mouth and get the boulder. Set the boulder on the table in the center to make the second statue open its mouth, then enter to get a Golden Banana. 5 (Kasplat) From the DK Door, follow the path up the second set of steps, then enter the opening on the right wall. Enter the tunnel and go forward to find the Kasplat, then defeat it for for its Green Blueprint Piece. Zozozo~ kyassuru Fearsome Castle; 「ゾゾゾ～」 zozozo~ and variants of it are onomatopoeic for unsettling, fearsome laughter. The background music for Creepy Castle (and the music that plays in some of the dungeons) is an arrangement of the theme song from Donkey Kong, where Pauline was getting taken to the top of the construction site. It is also an arrangement of the Dragnet theme "Danger Ahead". 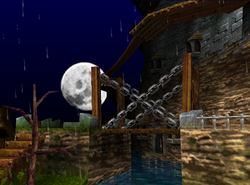 The main theme of this level was also composed for a Banjo-Kazooie level called "Prickly Pear Isle," a level that was ultimately cut while the game was still known as "Project Dream". The museum's background music has a sample of Bach's Toccata and Fugue. A similar sample can be heard in Banjo-Kazooie when entering the haunted church in Mad Monster Mansion. This snippet was also used in the arcade versions of Donkey Kong Jr. This page was last edited on March 5, 2019, at 22:10.